Make sure you have the right gear with you when it all goes South. Check out our top recommendations to keep you safe in a survival or disaster scenario. This Estwing axe is a firm favourite amongst our bushcraft and Survival friends. Razor sharp and you can clip it onto your belt with the included sheath. We never leave home without ours, neither should you. When it comes to quality you really can’t go wrong with Estwing. 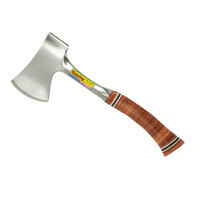 This axe, used by foresters, bush crafters, campers and survivalists alike is definitely one for the pack. Built to the highest standards you can trust in the Estwing Axe when you next head out into the Wild. Verdict: Manufactured from 1055 carbon steel with special bar quality the Estwing Sportsmans Axe is heat treated to ASME safety requirements, giving it a 45-60 Rockwell standard grading. Estwing have been in this game for a very long time and are still one of the most popular brands today. That says a lot for their quality. This Axe is no exception. A great feature of this particular model is the single piece construction. Never worry about a loose head flying off into teh woods again. The only issue we found on this axe is that the coated leather handle tends to loose its varnish coating over time. The easiest way to overcome this is to remove the varnish and to treat the handle with some oil. That way it will last for years. If you are in the market for a new survival or bushcraft axe then you should get yourself an Estwing. USA made and top quality. Here is a great review by Black Owl Outdoors to give you an idea of the quality of this Eswing axe. Sharp, versatile and definitely one for your outdoor pack. Sometimes we come across a product that really catches our eye. 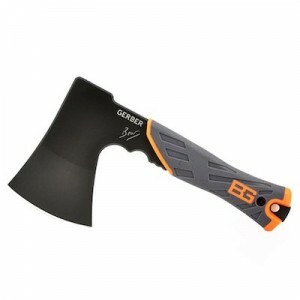 The Bear Grylls Survival Hatchet from Gerber is one of those products. Now you might think that having an axe out camping for the weekend is a bit overkill because traditionally they are heavy, large cumbersome tools and that you can do just fine with a good quality camping or survival knife but this axe is quality. First lets look at the high level features and then break it down into more detail. It has a quality rubber handle that provides plenty of grip and two finger notches near the head so you can grip it tightly for carving jobs. It is a full tang construction so will not let you down. 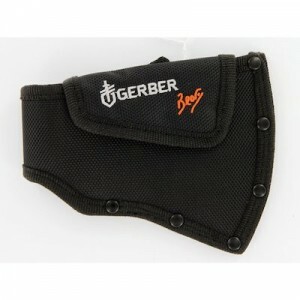 Comes with a slim nylon sheath complete with belt loops so its easy to carry around. The Blade is 3.5 inches and overall it comes in at 9.45 in length. We have used plenty of products from the Bear Grylls range and because they are made by Gerber you know you have quality in your hand. First up is the construction. It is made from a full tang construction design – all made from a single piece of steel. Experts will always sway towards full tang because it is the strongest way to construct it. Think of all the survival knives out there – most top rated knives will be full tang. You do not have any joints that could fail when you put it under a bit of pressure so the hatchet will stand up to tough jobs around the campsite or in the forest. It is made from high carbon steel so will probably last longer than most of us. It may be compact but really punches above its weight. Incidentally it weighs in at 1.4 pounds so is light enough to carry about but all business when you need to get stuck in to some chopping action. It is right at home chopping up firewood to keep you warm or because of its razor sharp blade and quality design you can use it for more intricate jobs like carving up tent pegs or making yourself an emergency shelter. Like every blade or tool you use around the campsite be careful. 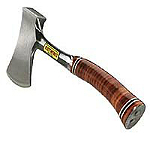 This hatchet, while small is still razor sharp so don’t leave it lying around for the kids to play with. Lets take a quick look at the handle first on our features list. Its super grippy rubber handle is perfect, even when wet. You get a good feel for the tool when using it but will cushion your hand when you are doing something heavy duty like chopping down a tree. They even designed a flared end on the grip so no fear of it sliding out of your hand when swinging it about like a mad man. As mentioned above it has finger cutouts near the head. This gives you much more control in your hand when you are working on more delicate operations like carving or whittling pegs. You loop in your fingers and its like an extension of your hand – except with a razor sharp edge. You could nearly substitute it in for your knife in some cases because it really is that good. The blade itself is razor sharp and because of the curved edge it is much easier to chop heavier items like logs without it getting jammed. The back of the head has a cross-hatched hammer edge which is very handy from banging in pegs or even knocking a big of steak into shape if you want to go all caveman on the meat. We mentioned the handle already but just to note that there is a handy lanyard hole in the end of the handle so you could run a bit of para-chord through it and hang it up out of the way. It does come with a mould resistant sheath that has handy belt loops. This makes it very easy to transport it around. Just run it through your belt and off you go. Its light and compact so wont weigh you down. 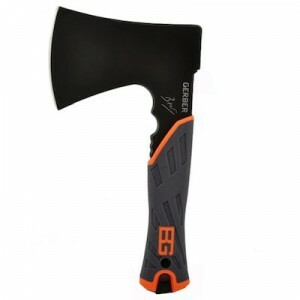 Our overall rating of the Bear Grylls Survival Hatchet is five stars. It is lightweight but deadly effective and has so many use cases that we could write about them all day. The best way to see how good it is would be to go out and buy one yourself. You will be glad you did. Its running at about $30 over on Amazon at the moment so go take a look. Our final though on this: We love the Gerber range of knives, tools and pretty much everything they make and this Gerber mini hatchet is no exception. Word class technology meets rugged survival gear. The next time you are in the market for some high quality camping or survival gear you should check them out first. If you have used one of these hatchets in the past then please leave us a comment with your experiences. Feedback from the wild is what this website is all about. 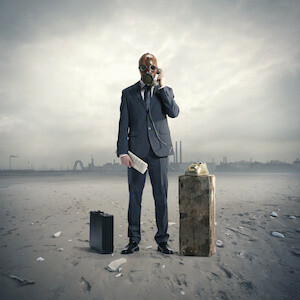 We have our own opinions on the tools we use but are always ready to take on board the findings of our readers. So thats our Bear Grylls Survival Hatchet review from Gerber. We hope you found it useful. Thanks for stopping by Wildgetaway.com and see you out there someday.